The Man Bible from LA Casey is a LOL book. 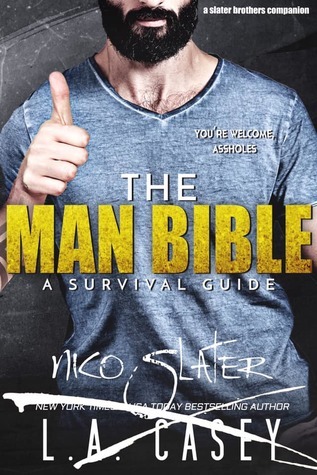 It’s written by “Nico Slater” from the Slater Brother’s series and if you haven’t read the series, you will be missing out on the back story. This book is written with love for Nico’s four brothers to help keep them out of hot water with the ladies in their life. I laughed so hard reading this I was crying as it is spot on with what it’s talking about. I won’t go into details but let’s just say what to say or not to say sums up this short little read, that all men should actually pick it up because the data is golden. LA – thank you so much for the Slater brothers, the ladies they love and their family’s have been such a great adventure and this book puts a funny/happy wrap up to the series. It’s a series that i can read over and over and still fall in love with them more and more.